Includes 20 Choice circulated (VG-XF) U.S. Peace Dollars. Dates will mainly range from 1922-1925. 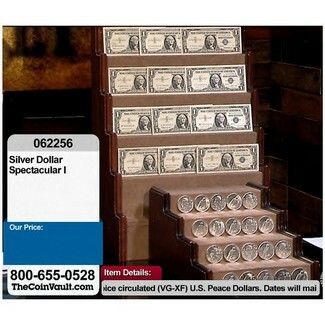 Also included is 20 $1 U.S. Silver Certificates in average circulated condition. Notes will either be series 1935 or 1957 and will come at random our choice. Coins will come in a sure safe coin shipper and notes will come in a protective sleeve.